Healthy 'N Fit ANABOLIC AMINO 10,000 is formulated to increase muscle mass and strength in combination with intense training. Contains pharmaceutical grade free-form and peptide bond amino acids, all in their "L-"configuration and correct proportions to promote anabolic activity. Amino Acids are the building blocks of muscle tissue. Each serving of ANABOLIC AMINO 10,000 contains 10,000 mgs of the highest quality peptide bond and free-form amino acids derived from whey hydrolysate and an enzymatic digest of egg albumen, both considered to be two of the highest quality and most effective amino acid sources on the planet. These amino acids are in their "L-" configuration and their correct proportion so they can be quickly and efficiently absorbed and transported to muscle tissue. 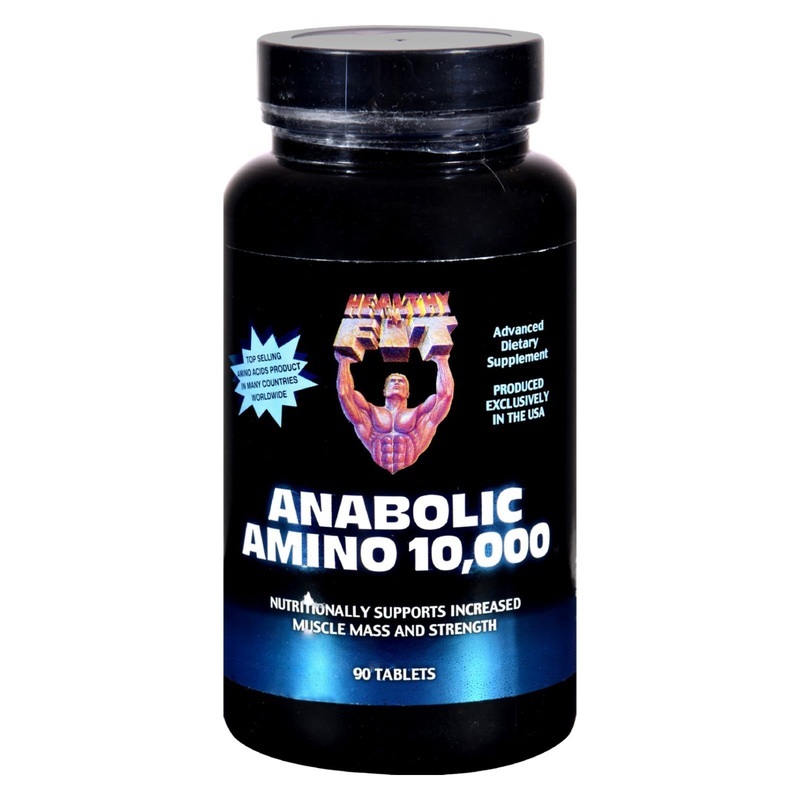 ANABOLIC AMINO 10,000 provides your body with the amino acids necessary to increase muscle mass and strength, to prevent muscle breakdown, and to promote muscle protein synthesis, anabolic activity, and PNB (positive nitrogen balance) - when used in conjunction with intense exercise. IMPORTANT - Many other "amino" products are really just protein tablets with little or no actual amino acid content. Some other products even contain lower quality gelatin or soy protein. 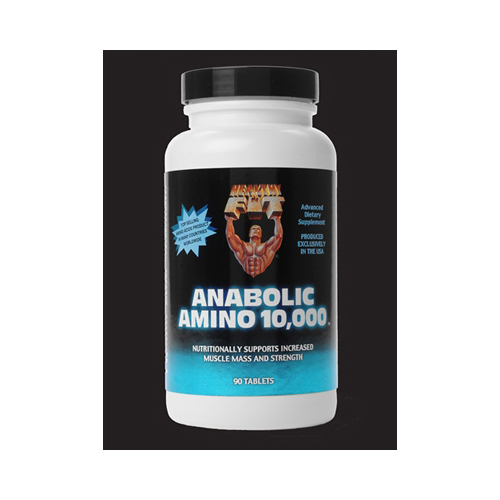 ANABOLIC AMINO 10,000 is a true amino acids product and is higher in potency than most competing brands. It contains only naturally occurring amino acids, we add no additional amino acids from synthetic sources. These statements have not been evaluated by the Food and Drug Administration. These products are not intended to diagnose, treat, cure or prevent any disease. Information such as specifications, ingredients, nutritional information, pricing, and availability, etc. are subject to change at any time without notice. Please refer to the actual label of the product for the most accurate information. As a reminder, it is always recommended to check with your health care provider before taking any dietary supplements or making any major changes to your diet or exercise program. Be sure to read the entire product label before taking any product. The information provided on this site is for informational purposes only and is not intended as a substitute for advise from your physician or other health care professional or any information contained on or in any product label or packaging. These products are designed to be used in combination with a healthy diet and exercise program. L-Alanine, L-Arginine, L-Aspartic Acid, L-Cystine, L-Glutamic Acid, L-Glycine, L-Histidine, L-Isoleucine, L-Leucine, L-Lysine, L-Methionine, L-Phenylalanine, L-Proline, L-Serine, L-Theronine, L-Tryptophan (Natural, No Synthetic L-Tryptophan), L-Tyrosine, L-Valine, Pharmaceutical Grade Free Form Peptide Bond Amino Acids. Other Ingredients (May Contain Any Of The Following): Microcrystalline Cellulose, Dicalcium Phosphate, Silica, Croscarmellose Sodium, Stearic Acid, Magnesium Stearate, Calcium Sulfate, Pharmaceutical Glaze, Carnauba Wax, Hydroxypropyl Methylcellulose. 5.5" x 3" x 3"